Hadn’t heard that before…I feel it a fitting tribute under the circumstances. 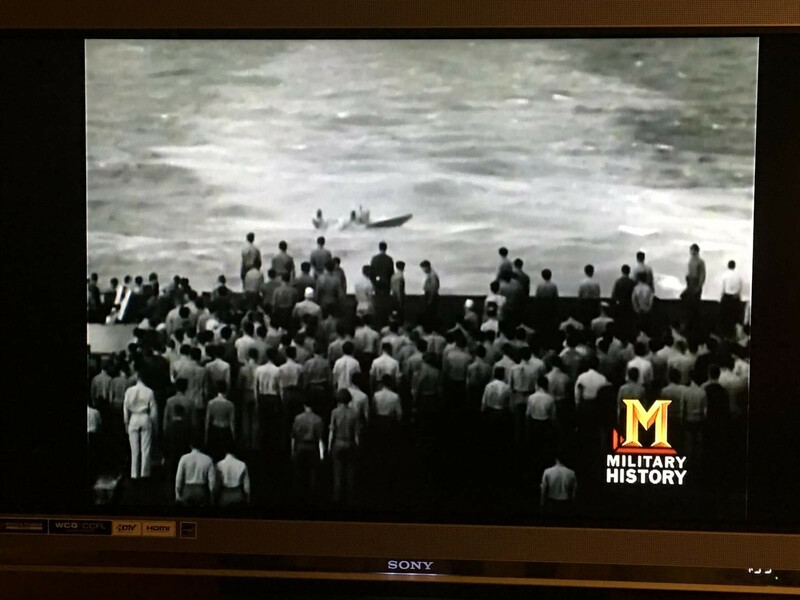 I remember watching this on a TV documentary called “Battle Group Halsey” several years ago. I also saw an interview with the pilot Robert Cossgrove shortly before he passed away. He was standing beside a restored a Grumman Avenger at an air show. It inspired me to build a tribute model dedicated to the crew using the Accurate Miniatures kit. 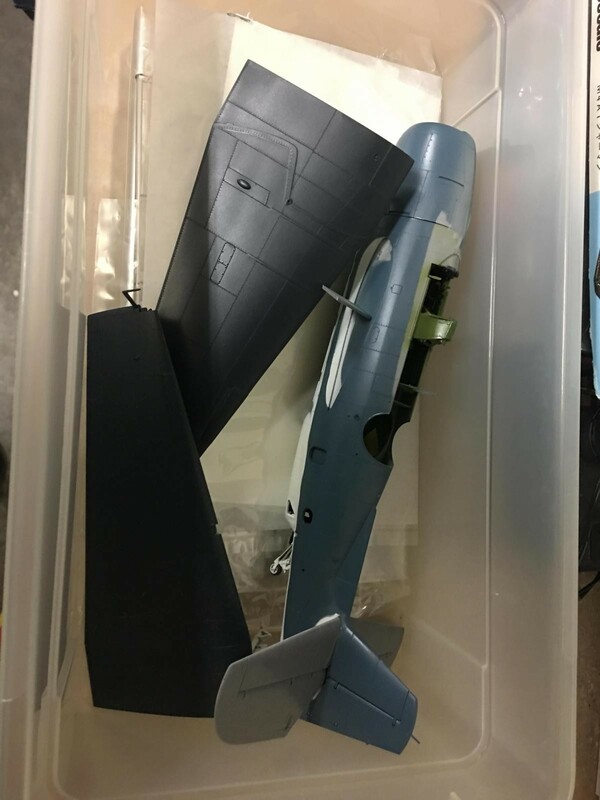 It’s currently stored inside a large plastic container and is about 3/4 completed. Thanks for the info, Louis. Hopefully you will complete the tribute, one day, and post it as an Article. Or even post it unfinished. If you do, please ping me. Would like to see it. Here’s a few pictures of the project. It stalled out because I was not sure if I wanted to build it with the wings folded or not. So I picked up the “Dangerboy” wing fold set and that’s where it sits to this day. It really needs to be completed. 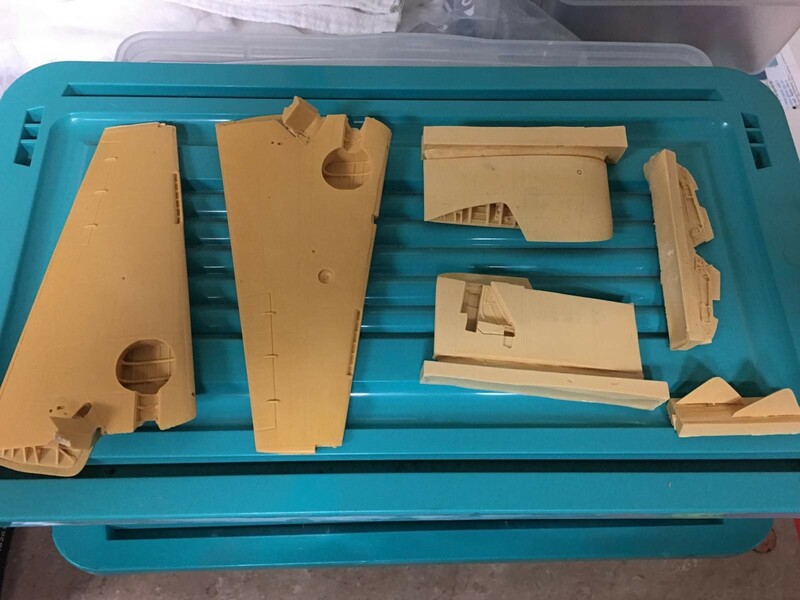 Louis, I have that Avenger ‘Accurate Minatures’ kit – boy that’s a wonderful model. I’m definitely saving that one for a special build. Once I saw this on TV David, I just knew that someday I had to build it. I wanted to build it up using the very best kit I had in the stash. The AM kit fit the bill. 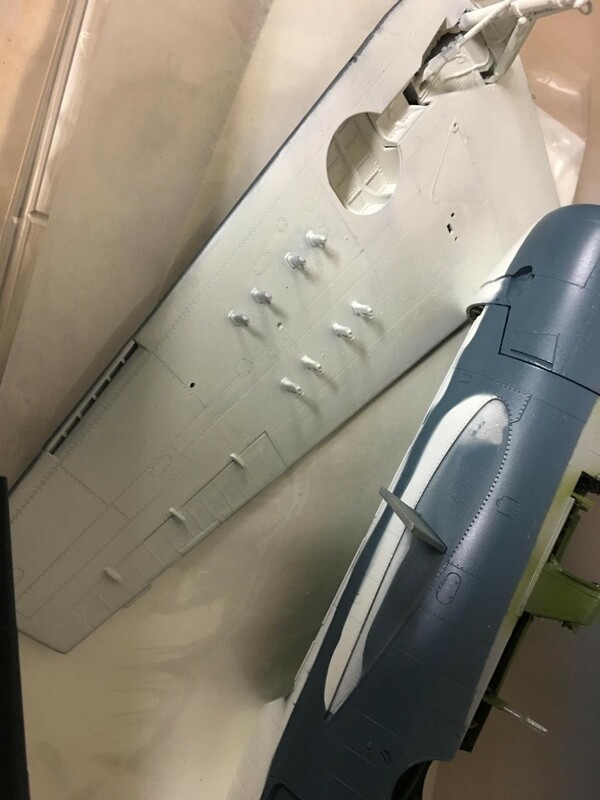 As the Avenger taxied in it was as if the folding wings were those of a protective mother shielding Deen from the view of the many onlookers and cameras. Here’s a picture I took from a website actually dedicated to Lloyce Dean, the rear gunner for use as a reference for this build. Exactly what you stated Josh. Cosgrove folded up the wings immediately after landing. Here he’s taxiing away from the wire. In this next photo they are confirming his identity through fingerprints. The Chaplain is also saying a few words if my memory is correct. 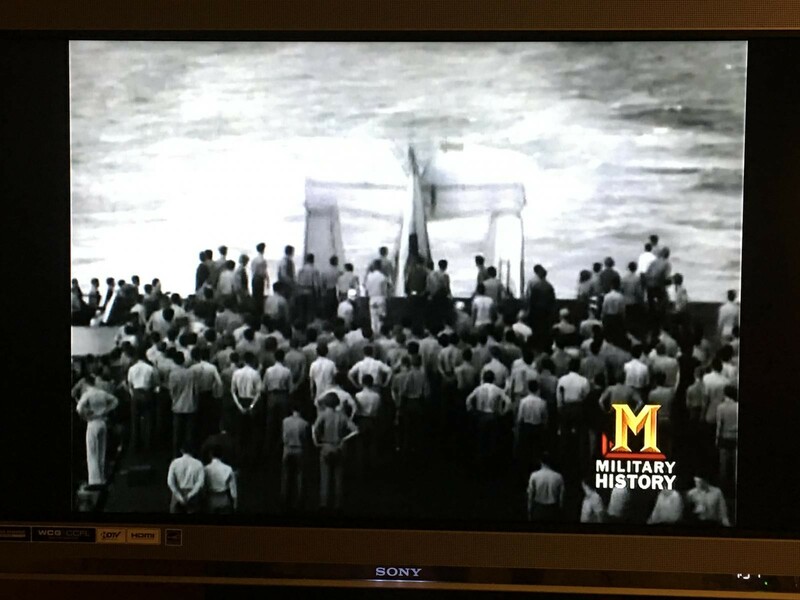 I think that this was originally aired as a part of the weekly television series called ” Victory at Sea”. It may have also been shown as a part of the series “The World at War” from the 1970’s. 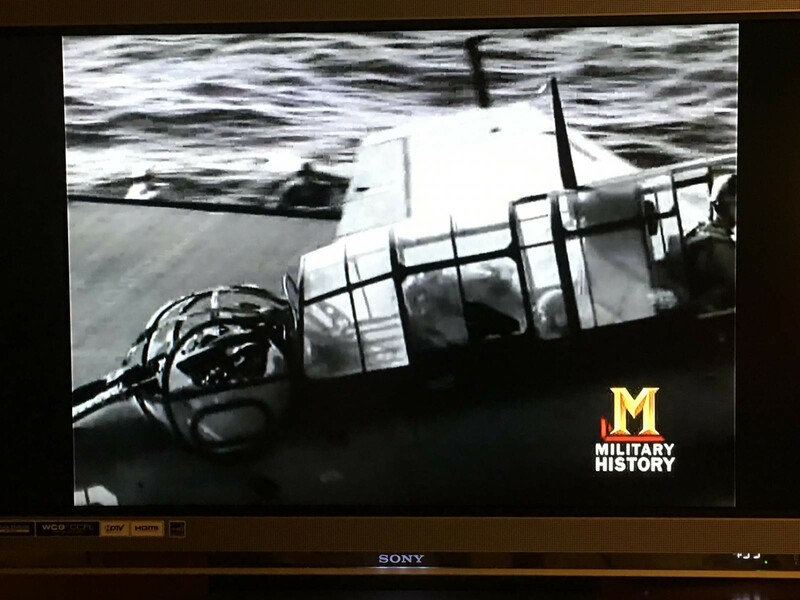 Here’s a few pictures that I took from the TV show called “Battle Group Halsey” that aired on the Military History channel a few years ago. 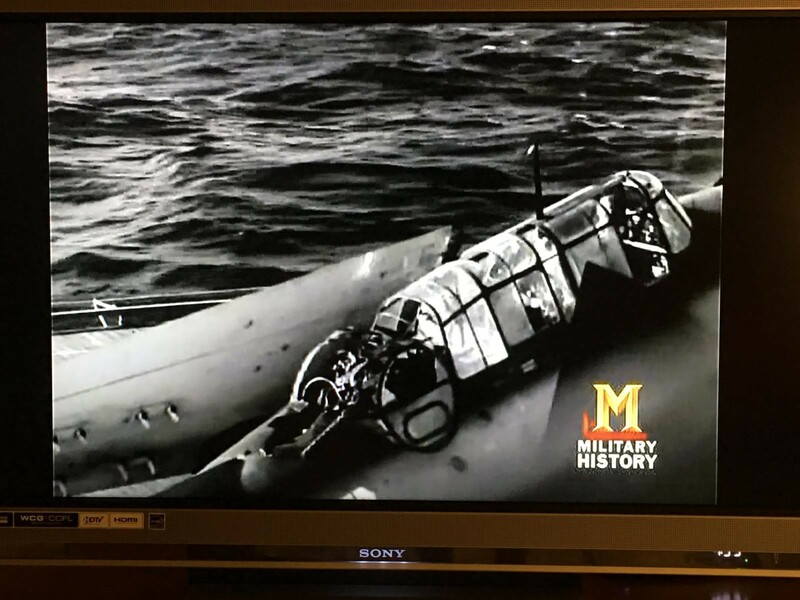 In this next photo you can see the “stinger” gunner sitting at the middle crew station looking to the rear. Earlier in this flight, right after Deen was killed, he asked permission to leave his station. He reported to the pilot that Deen had been “hit real bad” and that “blood and teeth” were dropping down on him. Here Cosgrove is taxiing the plane into the parking position. The wings are folded completely now and you can see how devastating the damage is to the rear turret where Deen was. If you look closely you can see how the barrel of the MG was even bent. 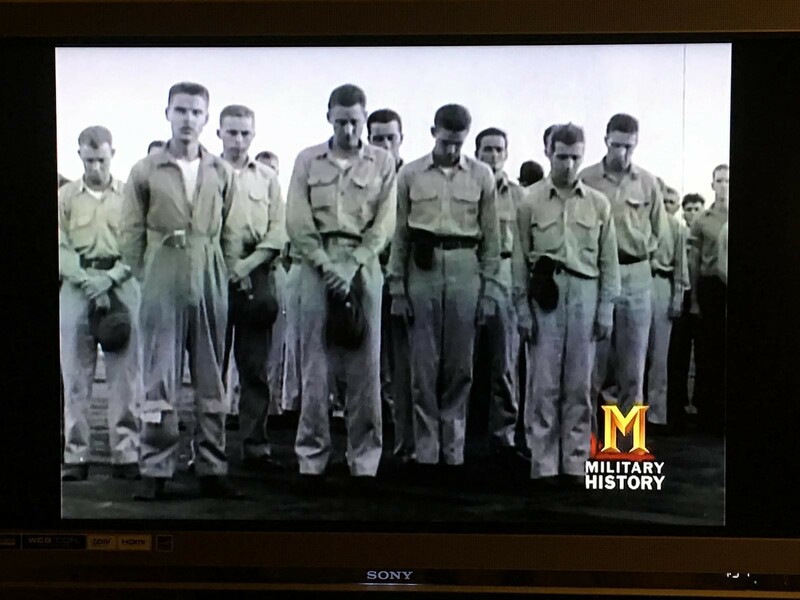 Here is the pilot Robert Cosgrove standing in the left side of the picture, next to the man with his hands crossed in front. This was during the funeral ceremony as words were spoken by the Chaplain. He is still wearing his flight coveralls. These next pictures are as the plane was being pushed of the fantail. With Deen still inside it. Very touching service. It reminds us of the sacrifice made by many people of all Nations. I remember hearing about this, never saw the film clip, thanks. November 5, 1944. My writing mentor, Wendell Mayes, was an FDO on the Essex. 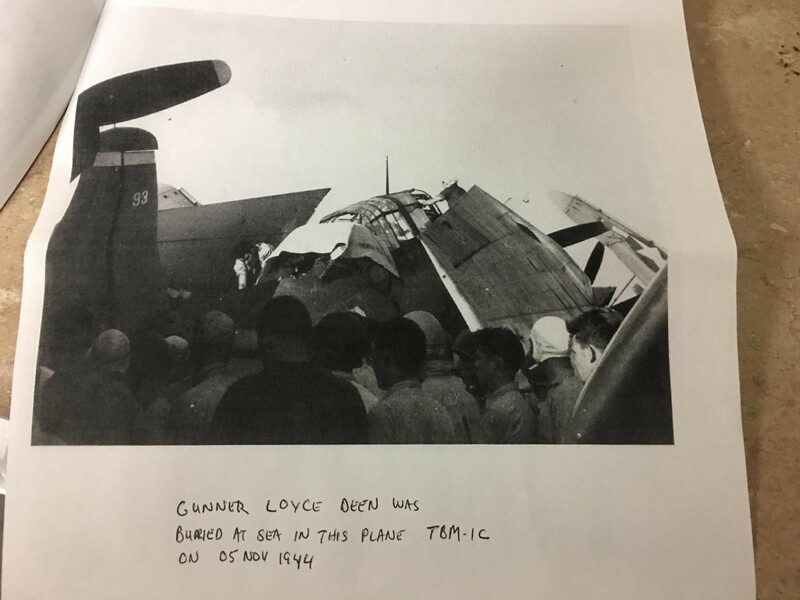 He told me it was “the saddest event I experienced in the entire war.” Jim Duffy, who was in AG-15, told me the first two guys who got up on the plane after it landed turned away and threw up at what they saw. 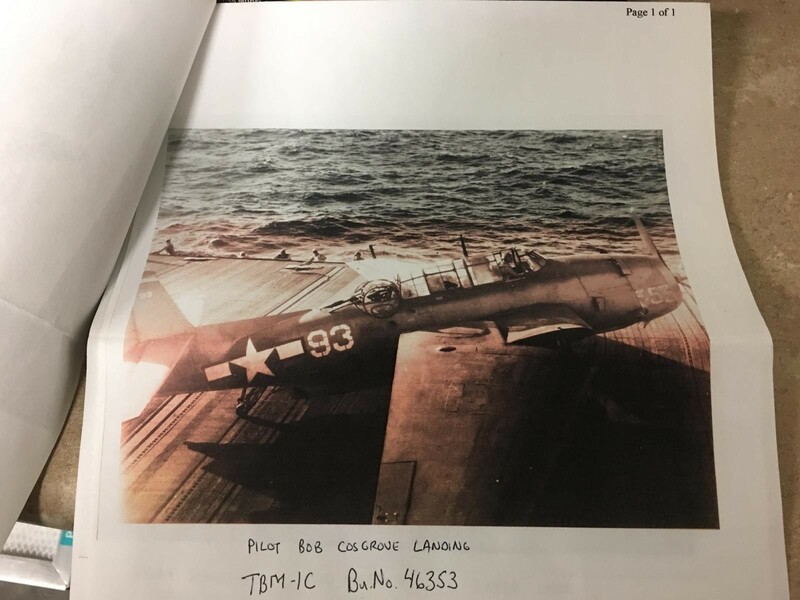 They didn’t have time to do anything else, because they got a warning of inbound enemy aircraft and by then, every attacker was seen as a potential kamikaze, so the air boss decided to bury him in the plane. Deen was decapitated by a direct hit of a 25mm shell. Deen and Digby Denzel, the radioman, were best friends – they first met in the barracks at Norfolk after reporting to the squadron, and decided they’d fly together, so they went looking for a pilot they thought they could trust, and chose Bob Cosgrove because he’d just spent the previous year as an instructor, so they figured he knew what he was doing, not realizing they’d just chosen the most aggressive pilot in the squadron. One of the very best things about this hobby is that all these years later people are still talking about (and paying tribute to) men like Deen. I used to be a little ‘shy’ about being a scale modeler but some time ago I came ‘out’ as ‘loud and proud’ because of posts like this. Your contribution shows that this is an excellent forum. 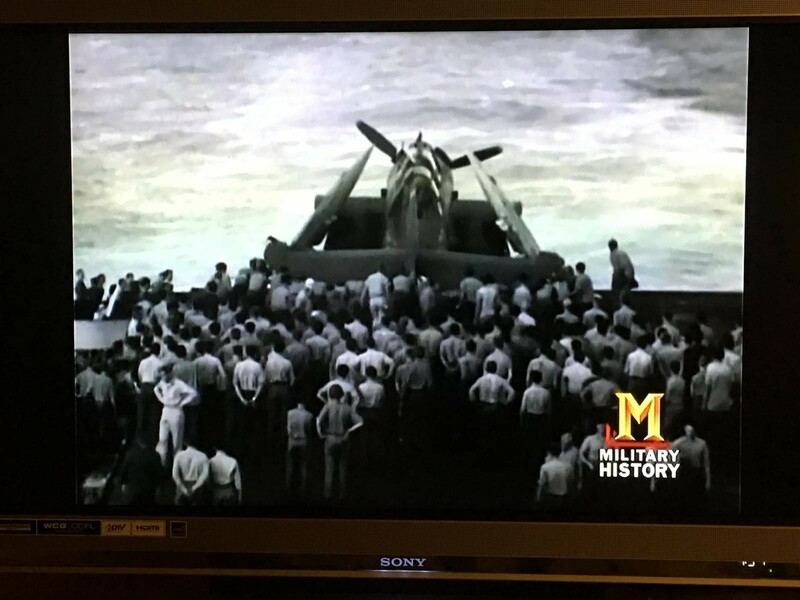 Fascinated by aviation and especially Naval Aviation your article shows again what a massive sacrifices were necessary to bring this war to a good end.